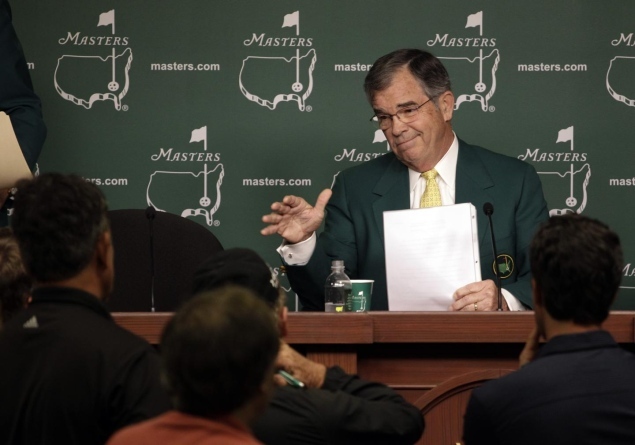 Violation: Augusta National Golf Club decide to discriminate. Explanation: Ah, the sights, sounds, and tradition of Augusta National. Anybody who has any semblance with the sport of golf -- or sports in general for that matter -- has heard of the history and magnitude that surrounds the Masters. The first of four annual major golf championships, the Masters is held once a year at Augusta. For those who aren't familiar, the golf club opened its doors in 1933, but only to men -- at the time, this was not unheard of. Fast forward to today. It is customary for the tournament officials to offer invitations to their sponsor's officers, and this year, IBM's newly appointed CEO happens to be a woman, Virginia Rometty. Sadly, no formal invitation will be extended. Don't get me wrong -- I am all for tradition and history as much as the next guy, but only to a certain extent. In a country that prides itself on being open-minded to equality and social change, this is a major statement telling us otherwise. With precedent already set in other sporting events (i.e. The U.S. Open tennis tournament provided the rest of the world with a template by mandating equal prize money for both men and women), it's a shame that the decision makers at Augusta still didn't step up. Punishment: With President Barack Obama visiting the tournament grounds on Friday, I expect an executive decision overruling what happened, or more accurately, what failed to happen. I just wish the men at Augusta had a little more foresight and a better understanding of the current age. With that being said, I hope women across the country are admitted to golf clubs from here on out. I'm man enough to say it: "girl power." ANGC is a private club so they can do whatever they want. Their club, their rules. Simple as that. "In a country that prides itself on being open-minded to equality and social change, this is a major statement telling us otherwise." ANGC doesn't represent the USA and isn't affiliated with our government. Again, their club, their rules. I just don't understand why people who have no connection to ANGC are trying to tell them what to do. Hootie Johnson (past chairman of ANGC) said they (the club) would do things on their own time and not "at the point of a bayonet." Sounds right to me. If they put an onus on tradition, why not keep the tradition of allowing sponsor's officers to become club members? Double standard. I couldn't agree more! It's these types of double standards that folks use to continue acts of discrimination. Their rules so they should follow them right? Their supposed rule is male-only membership and they are following said rule so what's the problem? In the end the problem is that a private golf club still feels the need to have rules like this in place. Of course it is a private club and they can do as they please, but really? no females, seems a little behind the times. So you're also suggesting they need to get rid of their manual scoreboards and go with electronic, right? Should they jack up all their food prices from $1.50/sandwich to $6.00/sandwich too? There's a reason the Masters is "a tradition unlike any other." Lawrence, are you really defending this or are you joking? This is the definition of discrimination. You just had the opportunity to visit the Golf Club and enjoyed a once in a lifetime moment. What if they didn't allow Asians as patrons and you couldn't enter the grounds based on your race? This was the case for the African American population until 1990 (although the Civil Rights act was passed 26 years prior in 1964). I really am defending this. There are numerous women's clubs and Jewish clubs and all sorts of other private clubs around and I don't see any problem with any of them. Do you have a problem with all of those too? Them hypothetically not letting me into the tournament as a patron based on my race is nothing like them choosing to remain a male-only club. You're comparing apples to oranges. Yes. I have a problem with clubs discriminating. EPL Power Rankings - Title Chase Over? Sunday Night Fights: Round 4!